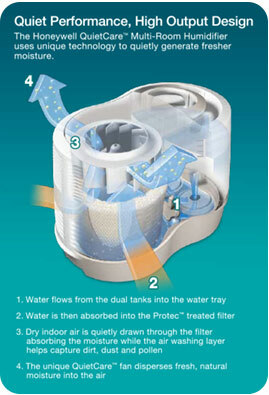 Soothing invisible moisture for multi-room dry air relief. 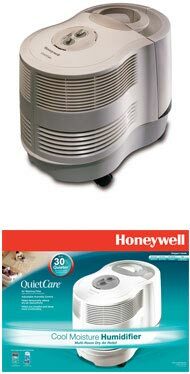 The HCM-6009 Cool mist humidifier features quiet performance technology and dual tanks for optimum performance. The Honeywell QuietCare™ Cool Moisture Humidifier was once designed for multi-room use, providing maximum comfort in large spaces. QuietCare Technology provides a comfortable humidity that may be as much as 30% quieter than competitive models. Also, the twin tanks includes a wide opening best, makes filling, cleaning and use easy! Why use a humidifier? See these great benefits!